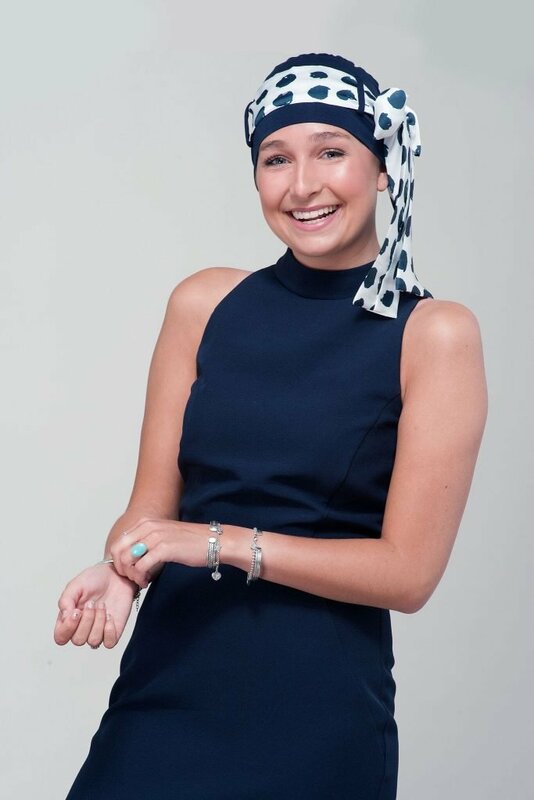 Headwear for teenage cancer patients – Yanna navy white polka dot from Masumi Champions range is one of our favourite and best selling styles. A clever combination of both hat and scarf which can be styled in six separate yet equally chic ways. So, whether you need an easy-to-wear everyday piece to go out for shopping or class or an elegant scarf for a night at the opera, or a knockout hat for a dinner with friends or a great night out, we are sure to have a solution to help you rediscover the former stylish, confident you. The Yanna colour Navy White Polka Dot has a navy hat with cute polka dot design, which is designed beautifully on the scarf and can be styled in so many delightful ways, suitable for everyday use, as well as for wearing on those special occasions.